“Sidrabong” is now known as Arya Tea Estate. ( Since- 1885 ) The legendry garden still preserves the house in which the monks dwelled back in the 1800s. As the legend goes, a monk who was believed to possess extraordinary spiritual powers chanced upon a hill and was left speechless by its purity. He looked all around and felt a sense of elation, for what he saw was a stunning expanse of beautiful hills being nurtured and caressed by the freshness of the wind. world. The monk was already revered for his Chinese seed development skills, and here he was- at gates of Paradise, about to discover a flavor divine. He along with his fellow monks, set about with experimental plantations. They studied in great detail the nature of soil, topography and the weather pattern for years till the right conditions were identified. The hard work yielded rich results as the flavor surpassed their expectations. Hence was born an exceptional brew-inimitable and unmatched till today. 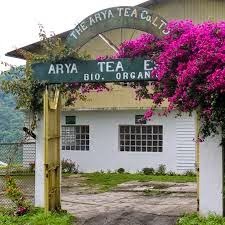 The “Sidrabong” gardens were thus established by the monks in the 19th century and the legendary formula was passed over, giving us “Arya Monk” Bio Organic Certified Darjeeling Tea. High and mighty, majestic and proud – Darjeeling awakens to the mystic Himalayas creating an imposing backdrop. Thousands of tourists flock to a vantage point known as Tiger Hill to witness the beautiful sunrise- a sight reserved for those who have perhaps prayed earnestly for an experience so blissful. Prayers are answered here, in the hilly North Eastern region of India. In fact, life is a divine experience in this part. To watch the queen of the hills unfold her mysteries is an extraordinary experience. People from various parts of the world are surprised to discover that this sleepy little town is in fact a multifaceted gem with its British landmarks and intrinsic East Indian constitution, very different from the rest of India, to say the least. Darjeeling brings a fresh lease of life to the tourist, besides throwing in many a pleasant surprise. The Queen of hills, as it is rightly called, is a wonderful place to be. The tea gardens are part of coveted region on the face of the earth- a place where the world’s most fabled tea is grown.